In large bowl, combine flour, baking powder, baking soda and salt; mix well. Using fork or pastry blender, cut in 1 cup margarine until mixture is crumbly. In small bowl, beat eggs. Gradually add sugar, 1 teaspoon vanilla and lemon extract, beating until light. Add to flour mixture in large bowl. Stir by hand until dough forms. (If necessary, knead dough with hands to mix in dry ingredients.) Cover with plastic wrap; refrigerate 1 hour for easier handling. Heat oven to 375°F. 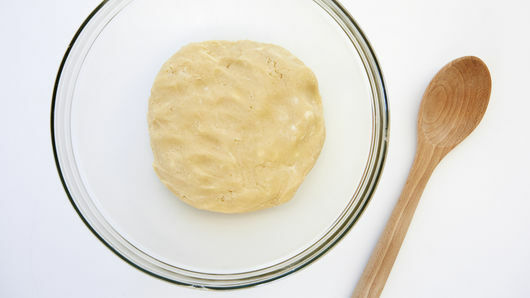 On lightly floured surface, roll out 1/3 of dough at a time to 1/8-inch thickness. (Keep remaining dough refrigerated.) 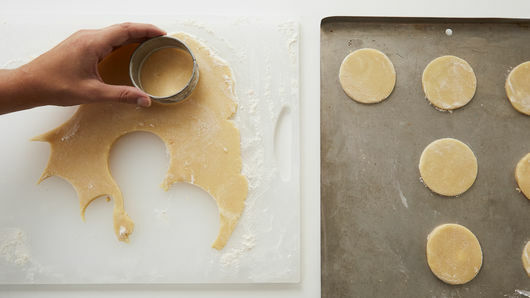 Cut with 2 1/2 to 3-inch floured cookie cutters. Place 1 inch apart on ungreased cookie sheets. If desired, decorate with decorator sugar or multicolored candy sprinkles. Bake at 375°F. for 6 to 11 minutes or until edges are light golden brown. Immediately remove from cookie sheets. Cool 15 minutes or until completely cooled. For a whimsical touch, trace children's hands onto paper and cut out the shapes. Then place the cutouts on the dough and cut around the shapes. Decorate baked cookies with frosting to look like rings, bracelets, watches or colored fingernails. This tried-and-true, old-fashioned sugar cookie recipe made from scratch is one your cookie exchange can’t do without! If you’re trying to get a jump on the holiday baking and want to freeze these cookies and decorate them at a later time, there are a few hard and fast rules you should follow: To freeze cookies: Place unfrosted, baked cookies in containers with tight-fitting lids and freeze for up to 12 months. (You can freeze frosted cookies, too: freeze them uncovered on a baking sheet, then package the frozen cookies between layers of waxed paper in a rigid container for up to two months.) To thaw frozen cookies: Thaw soft-textured cookies in the container at room temperature or place them briefly in a microwave oven. Crisp-textured cookies should be removed from the container before thawing. Don’t have time to make sugar cookies from scratch? 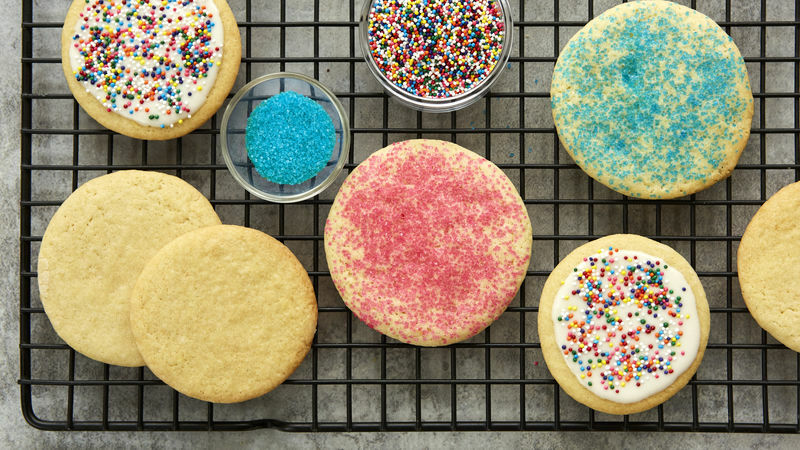 That’s ok—we have a shortcut for you using Pillsbury sugar cookie dough that’ll give you bakery-worthy soft sugar cookies every time.